Our student programs are designed to take advantage of the museum's collections to provide an immersive experience in Virginia history. Programs include content and analysis through interaction with primary and secondary sources. Workshops are FREE for students, teachers, and chaperones, but reservations are required. Student workshops may be reserved by completing our online Field Trip Request Form. If you have questions about timing or group size, please feel free to contact us - some guidelines are flexible or easily modified. Description: Participants will take a guided tour through our temporary Oh, Shenandoah exhibit and explore how Virginia’s diversity of cultures spread across the spectacular Shenandoah Valley. Participants will then have the opportunity to head outdoors, observe the neighborhood around them, and paint their own work of art to take home. Program Title: Games from the Past! Description: Participants will take a guided tour through our award-winning Story of Virginia exhibit and learn about how children in the past lived, worked, and played. Participants will then have the opportunity to play some games from the past. Not interested in the above programs? No problem! Feel free to browse our regular program offerings below, or book a tour of any current exhibits. Description: Using clothes and replica artifacts, students will take a journey through time to look at items of clothing from famous Virginians and important periods in Virginia’s history. Participants will be able to draw conclusions about life in the past vs. present, and talk about why individuals and communities lived, worked, and dressed differently. Description: Using primary sources and time in our galleries, students will be introduced to Famous Virginians. Participants will be able to discuss the contributions of these individuals to life in Virginia today, as well as think critically about different ways we remember people from the past. Description: Students will develop map skills and view primary and secondary sources by investigating a variety of maps to learn about basic map symbols, cardinal directions, and land and water features. Participants will also compare globes to flat maps, historic maps to modern maps, and local maps to national maps. Description: Using replica artifacts and primary sources, students will learn about the lives and customs of the Powhatan Indians in comparison to other Native American tribes, with a focus on the Lakota and Pueblo peoples. Participants will be able to compare and contrast these tribes, as well as explain what contributes to the differences in their lifestyles. Description: Students will spend time in our Story of Virginia exhibit learning about the diversity of population and perspective throughout Virginia history. We will analyze our system of government, and what happens when people don’t agree on the laws! In the classroom, participants will work together on an interactive activity that illustrates the process of creating and voting for different laws. Description: Using replica artifacts, images, and reproductions of manuscripts from our collections, students will explore a specific era of Virginia history in-depth. Permanent topics include Pocahontas and the Powhatans, the Revolutionary War, Westward Expansion, and the Civil War. Description: Specifically developed for elementary Virginia Studies students, this program follows the timeline of Virginia History from prehistory to the present day. Students will participate in a 60 minute gallery tour by viewing and analyzing objects on display, as well as participate in a 60-minute interactive classroom presentation that highlights four important topics in Virginia History (Pocahontas and Powhatans, Revolutionary War, Westward Expansion, and Civil War) through primary sources, secondary sources, and replica artifacts. We do advise that this program is best performed in the spring, after students have covered the majority of their curriculum. If you are looking for a fall visit, check out our Hands-On-History Boxes or Story of Virginia and Hands-On-History Box Combo. Description: Students will participate in a 45-minute Story of Virginia gallery tour by viewing and analyzing objects on display. 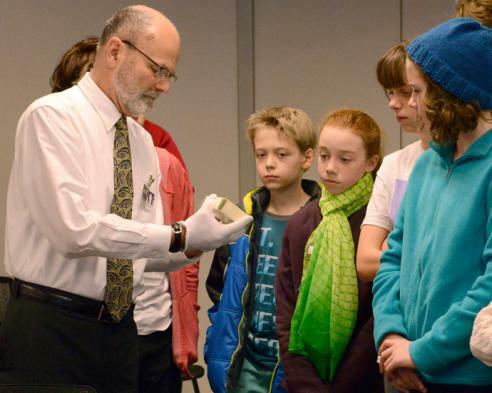 They will then dive deeper into a specific area of history with our hands-on history box interactive classroom activity that incorporates primary sources, secondary sources, and replica artifacts. Description: Using manuscripts, images, and replica artifacts, students will explore a topic from Virginia’s past. Students will interact with a variety of perspectives surrounding a specific issue, as well as analyze the impact of changing types of media. Topics include Virginia Indians, The Revolutionary War, Westward Expansion, Slavery in Virginia, The Civil War, Reconstruction, Virginia in the 20th Century, and Civil Rights. Description: Students will tour museum galleries to see and analyze how sources and artifacts are displayed to best illustrate a topic of your choice. This program also includes a classroom portion that focuses on analysis of primary sources, and finally allows students to “curate” their own pop-up exhibit for quick presentation to the class about why the students chose the images, sources, and artifacts that they did to represent the chosen topic. Topics include Virginia Indians, The Revolutionary War, Westward Expansion, Slavery in Virginia, The Civil War, Reconstruction, Virginia in the 20th Century, and Civil Rights. Teachers: Check out our online Teaching with Photographs. You and your students will be able to use this online resource to explore photographs from the early 1900s. Our custom programs can be for all age-levels, whether it is from a desire to dive more deeply into a specific topic, learn more about a topic not listed above, or work more hands-on with our vast collection of primary and secondary sources. Some past programs have focused on the African-American experience in Virginia, toys of the past, women in Virginia, and changing technologies. Custom programs are also a way to work our temporary exhibits into your visit – let us know what you are interested in! Please complete our online Field Trip Request Form with relevant information and a member of our education team will be in touch.